I love baking and I love eating what I bake. But after a lot of baking…and eating, I can definitely tell the difference in my waistline. So what’s a baking mama to do? Swap out my traditional sweet treats for these low calorie chocolate cookie recipes! These are packed with yummy sweetness without the extra fat, calories, or sugar that can pack on the pounds! Plus, they’re great for parties, kids’ snacks, and gifts, so you can share them with others! Need to stock up on even more healthy treats? 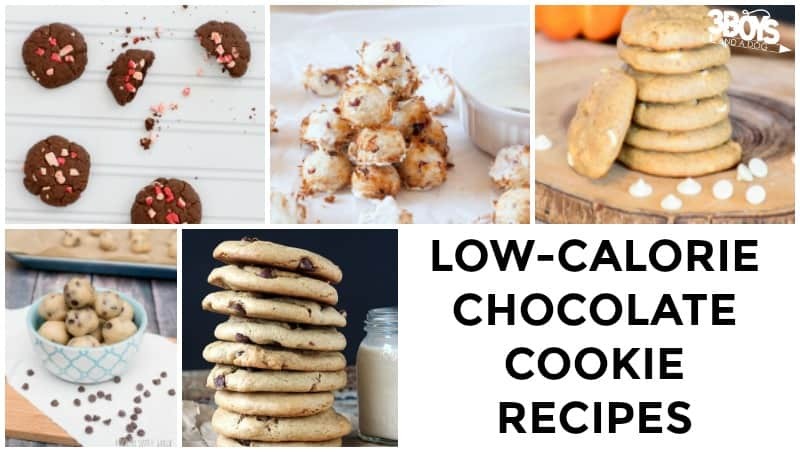 Don’t miss my list of over 20 low calorie cookies you can bake at home! 1. These Low Calorie Chocolate Chip Cookies are perfect for filling up the cookie jar! 2. Sneak some veggies into dessert with these Avocado Chocolate Chip Cookie Bars! 3. Get the sweetness without the added sugar in these Low-Sugar Cranberry Coconut White Chocolate Macaroons! 4. These light Chocolate Dipped Meringue Cookies are perfect for healthy snacking! 5. Bake up the perfect childhood treat – in a healthy way – with these Skinny Chocolate Chip Cookies! 6. These Chocolate Oatmeal No-Bake Bars are healthy and quick to make! 7. Pop a few of these German Chocolate Macaroons into your kids’ lunches for a light dessert! 8. These Healthy, No-Bake Fudge Cookies are a wonderful recipe to share with your children! 9. Avoiding carbs? 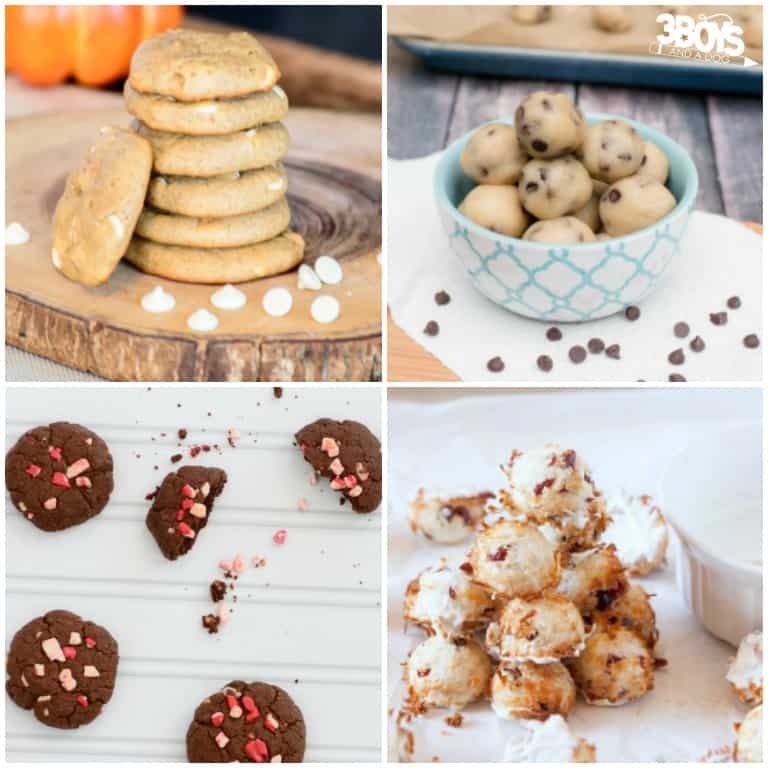 Try these poppable Paleo Cookie Dough Bites! 10. These Gluten-Free Chocolate Peppermint Cookies are soooo pretty! And they’re great if you’re on a no-flour diet! 11. Get some extra fiber with these Healthy Oatmeal Chocolate Chip Cookies! 12. In a hurry? Try these quick 5-Ingredient Chocolate Chip Cookies made with no flour! 13. Use healthy fats from nut butter in this recipe for Double Chocolate Chip Almond Butter Cookies! 14. Go raw with these yummy Raw Chocolate Oat Balls kids will love! 15. Cookies that are only 60 calories each? Sign me up for these 60 Calorie Chocolate Chip Cookies! 16. These Oatmeal, Cranberry, White Chocolate Cookies are hearty and healthy at the same time! 17. Try these low-carb Quinoa Chocolate Chip Cookies that are both egg-free and gluten-free! 18. Here’s another low-carb dessert to try: Flourless Peanut Butter Chocolate Chip Cookies! 19. These Double Chocolate Chip Paleo Cookies are perfect for sticking to a hunter-gatherer diet! 20. Get the healthy boost of dark chocolate with these Low-Carb Dark Chocolate Chip Cookies! 21. Avoid unhealthy fats and enjoy your favorite treat with these Coconut Oil Chocolate Chip Cookies! 22. Bulk up on protein with these Chocolate Protein Cookies! 23. Chickpeas are a wonderful source of fiber and protein. Try these Chickpea Protein Cookie Dough Balls! 24. These Gluten-Free Pumpkin Spice White Chocolate Chip Cookies are perfect for fall baking! 25. Dark chocolate has proven health benefits. You’ll love these Healthy Peanut Butter Dark Chocolate Balls! 26. Skip the refined flour and make these Whole Wheat Peppermint Chocolate Chip Cookies instead! 27. These No-Bake Chocolate Peanut Butter Sandwich Cookies are low-calorie IF you can stop yourself from eating the whole batch…lol! 28. Add some healthy sweetness to your dessert with these Oatmeal Date Chocolate Chip Cookies! 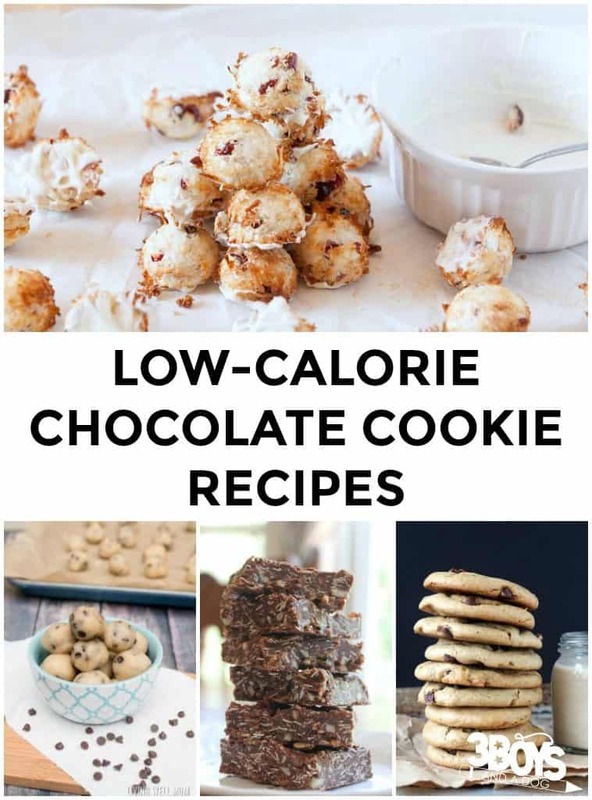 Pick up these affiliate resources from Amazon to bake up some low calorie chocolate cookie recipes yourself!